Anyone who has traveled America's vast interstate highway system has almost certainly seen them: The ominous White Crosses that pepper the desolate roadways. Being a well-traveled musician from the Indie band Noodle Muffin, I frequently encountered these road memorials during long treks across the Western U.S. badlands. 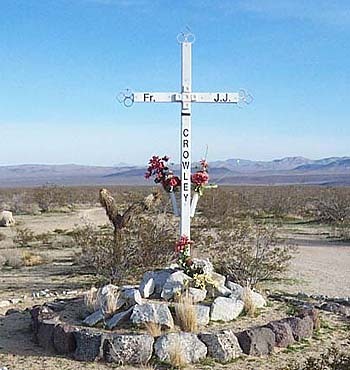 These white crosses are everywhere ... hiding among the desert shrubs, lurking around treacherous bends, decorating empty stretches of road ... Each monument evokes a slew of unanswered questions: How did the accident happen? Who were the victims? Why do their families and friends decorate and maintain these crosses? The lonely mystery and sad beauty of the monuments are irresistable. On this website, you can explore dozens of road memorials. I've put as much information as I can deduce from the monuments, and there are even a few cases where the riddle has been solved, thanks to Internet searches and diligent visitors. So, pull up a chair, grab a brew, and prepare to journey down the tragic highways of America. Oh, and for a soundtrack to your morbid journey, be sure to download some cool, free MP3's from my band Noodle Muffin, and visit our MySpace and Facebook pages. Enjoy! UPDATE 4/8/2008: TragicHighways.com (AKA White-Crosses.com) is now on Facebook! Check out the site and become our friend! UPDATE 4/5/2011: Okay, I admit it ... I've seriously neglected this website, but thanks to a little inspiration, I'm finally updating the website with numerous white crosses I encountered during a recent trip to South Carolina. It's amazing ... every single cross I ran into was a stereotypical "white" white cross, definitely lacking the originality of the California roadside memorials. There was one rather creative monument though ... the family planted a live rose plant at the memorial. Also, I'm adding photos from my recent trip up north to Visalia, CA, where I found an amazingly beautiful white cross from a young girl who died a few months ago (September 2010). 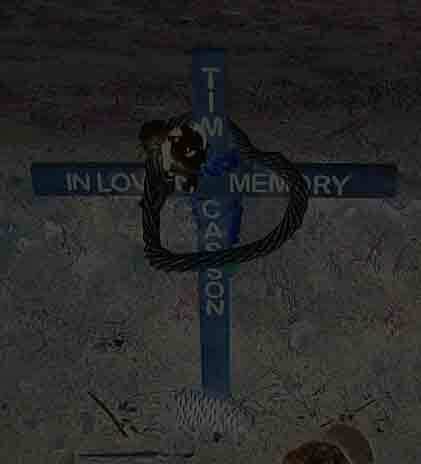 UPDATE 3/8/2008: Added info to "None Shall Pass" monument based on an e-mail from Genesis Dycoco's friend. UPDATE 8/19/2007: Thanks to "Nerdy Net Sleuth" Valerie, several of these White Cross mysteries have been solved! I've updated the corresponding pages and labeled them as "Solved by Val". Copyright 2003 - 2011 Fyoog State Records Photos and website content may not be reproduced without explicit consent.